First Line: Madame Keui was flesh and blood, or so they claimed, although nobody could remember touching that rewarmed flesh, nor seeing her bleed; not even when a second bullet passed through her. Well into his seventies, Dr. Siri Paiboun, national coroner of Laos, has finally been allowed to retire and enjoy life with his wife, Madame Daeng. But a general insists that Siri go with him to a remote village to find the remains of his long-lost brother, along with Madame Keui, a woman who returned from the funeral pyre as a clairvoyant. Seeing that he must go, Siri makes certain that there are a few perks included with the trip. He's taking Madame Daeng and Mr. Geung, his former morgue assistant. And it seems that this is an auspicious time to go on a journey: there's a tall, handsome, older Frenchman who's been asking around Vientiane for the whereabouts of Dr. Siri's wife, and Dr. Siri doesn't like that one little bit. Little does he know that Madame Daeng might have something to be jealous about herself, since he seems to be falling under the spell of the pretty clairvoyant. 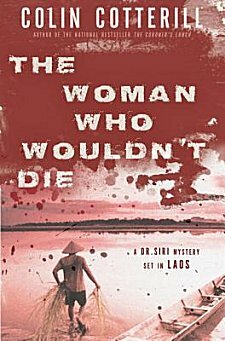 Dr. Siri may not be aware of Madame Daeng's jealousy, but he is aware that there's more to this trip along the Mekong River than finding the remains of a big wig's brother. He only hopes that things don't turn deadly. ...Dr. Siri Paiboun...was a dashing, funny. intelligent man who taught us the real reason we should be proud. Not because some ancient king massacred another's army but because we were human beings. We had rights. We deserved respect. Getting to see this married couple in their youth is a treat, even though it is served up with a side dish of sadness as we learn how Laos and its people have been treated through the centuries. What makes this book the best in an excellent series is its plot. Cotterill ratchets up the suspense and dread to an almost unbearable degree as first one beloved character then another faces death. (When a killer walked into the building where Nurse Dtui was working, I exclaimed, "Oh, no you don't!" (Yes, I did say that aloud, and no, no one was in the room to hear me. Besides, I don't know what I thought I was going to do to save her anyway!) One of the reasons why Colin Cotterill's characters are so beloved is because they are good people: they treat everyone as human beings, they treat everyone with respect-- and when you read stories about such people who are also filled with love and humor and wit, you can't help but care deeply about them, too. If you've never read one of the Dr. Siri mysteries, please... pick up this one and read it. Chances are you'll love the story, you'll love reading about life in Laos in the 1970s, and you'll go crazy for Dr. Siri and the rest of the superb cast. And don't be surprised if you find yourself getting your hands on all the rest of the books in the series. Oh, Cathy, this is such a great series isn't it? I am so happy that Cotterill has continued with it. I really love the setting, the characters, the.... Thanks for reminding me of a unique and so-well-written series. You're welcome! It's always a pleasure to share favorite books and series with others who love them, too. I really liked this one! I bought The Coroner's Lunch years ago, but it's been languishing on my shelves. Then I got sent this one for review, and now I can't wait to go back and read others. Siri and Daeng's relationship was just so sweet. They've both been through so very much that it's wonderful to see them together. Each brings considerable experience to the relationship. I'm so glad you enjoyed this book! Oh yeah, my husband will be so excited! He LOVES Siri and tells everyone about him. Great recommend...hmmm...I see a good St Patty's Day gift for him! On another note, how did your yard fair with all of this cold weather? Did you get snow this week?!?! Crazy, huh? Sounds like an *excellent* St. Paddy's gift for him! As for the weather, I just posted a couple of photos of how our yard looked as part of my weekly link round-up!